J&N Feed and Seed is your local dealer for Sawdust And Splinters Wooden Furniture. Are you looking for that perfect swing for your front porch? Or, do you need new patio furniture for your back deck? At J&N Feed and Seed, you’ll find a great selection of rockers and other patio items made in Texas by Sawdust and Splinters. Outdoor furniture is an investment, so make sure you invest in high-quality pieces from Sawdust And Splinters. All furniture starts with quality lumber, followed with bolts, screws and quality workmanship, finished with Total Wood Protection stain to ensure quality service for years to come. We are proud to be a dealer of this fine furniture. Avoid the big box stores and come shop with us, where you’ll find a knowledgeable staff and outstanding customer service. 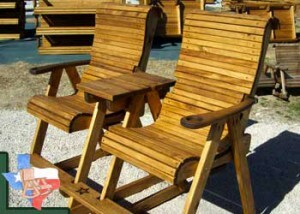 Sawdust and Splinters Wooden Furniture is handcrafted in Gatesville, Texas, by local craftsmen. You won’t find a better quality, look or comfort for your patio. Comfort and functionality are built into every product, including chairs, rockers, gliders, swings, tables and benches. Stop in and take a look at our wooden furniture. We’re betting you will agree, this is fine quality wooden outdoor furniture, backed by a solid dependable company with a history dating back to 1998! This entry was posted on Sunday, April 22nd, 2018 at 11:05 am	and is filed under News & Updates. You can follow any responses to this entry through the RSS 2.0 feed. Both comments and pings are currently closed.